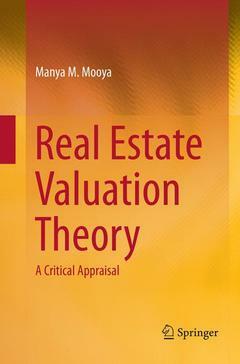 Real Estate Valuation Theory Mooya Manya M.
Add to cart the imprimé à la demande of Mooya Manya M.
This monograph critically reviews and updates real estate valuation theory, which is based on neoclassical economics, in light of developments in heterodox economic theory. Building on a comprehensive historical account of the evolution of value theory, the book uses new institutional economics theory and critical realism as lenses through which problems in standard valuation theory and practice are expatiated, and as the foundation for an alternative theory. The new theory is employed to explain major problems in real estate valuation that are beyond the capability of the standard theory, such as price bubbles in real estate markets, anchoring bias, client influence and valuation under uncertain market conditions. Preface.- 1 Standard Theory of Real Estate Market Value: Concepts and Problems.- 2 Aristotle to Marshall: The Evolution of Economic Value Theory.- 3 Traditional Valuation Methods.- 4 Automated Valuation Models.- 5 Real Estate Markets and Neoclassical Economic Theory - A Heterodox Critique.- 6 An Alternative Theory of Market Value: Ontological Foundation.- 7 An Alternative Theory: Market Value as Convention and Market Value as Emergence.- 8 Applications to Problems of Theory and Practice.- Postscript. Manya M. Mooya holds a PhD in Real Estate from the University of Pretoria, an MPhil in Land Economy from the University of Cambridge and a BSc in Land Economy from the Copperbelt University. He is currently Senior Lecturer in Property Studies in the Department of Construction Economics and Management at the University of Cape Town. He teaches courses on property valuation at both the undergraduate and postgraduate levels. His research work, both theoretical and applied, focuses on the twin questions of how value is created in real estate markets and on the links between these markets and capital accumulation.